Wang, H., Chen, J., Zhang, S., Zhang, D.D., Wang, Z., Xu, Q., Chen, S., Wang, S., Kang, S. and Chen, F. 2018. A chironomid-based record of temperature variability during the past 4000 years in northern China and its possible societal implications. Climate of the Past 14: 383-396. In providing the rationale for their work, Wang et al. (2018) write that "the study of past temperature changes is becoming increasingly important for improving our ability to predict the long-term trends of regional and global climate change, and to explore the relationship between climate change and human society." As their contribution in this regard, the team of ten Chinese researchers developed a robust 4000-year proxy temperature reconstruction based on chironomid assemblages in a sediment core from Gonghai Lake (38.9°N, 112.23°E), an alpine freshwater lake located on the northeastern margin of the Chinese Loess Plateau in the Shanxi Province. The reconstruction was then compared with published war and population records for the Shanxi Province in an effort to explore the relationship between climate change and human societal changes for this region. Wang et al. 's findings are presented in the figure below. As shown in the figure, although there have been multiple centennial-scale fluctuations, there has been an overall decline in temperature over the 4000 year record, which finding is not surprising, given that the record begins at the warmest interval of the current interglacial period, or Holocene. 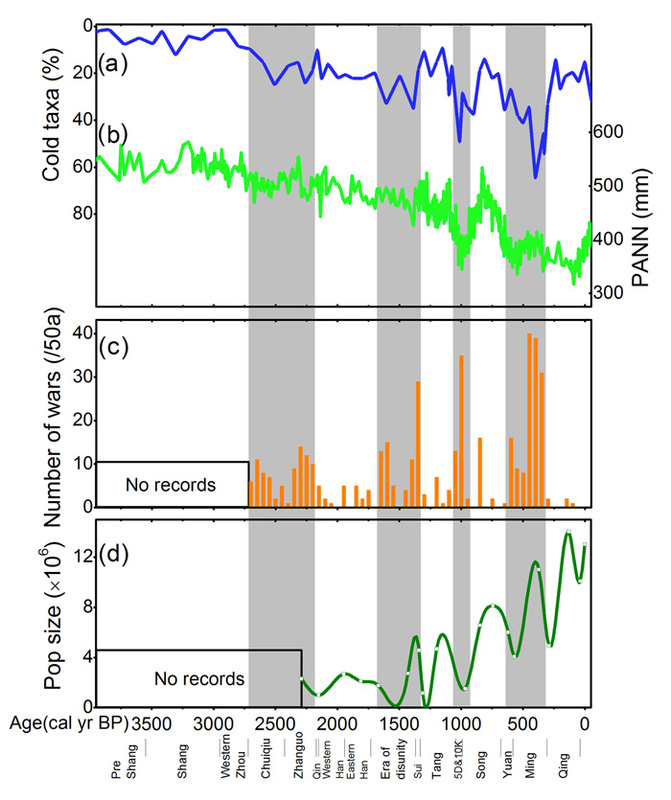 Notable warm events in the record include what the authors refer to as the Sui-Tang Warm Period (1270-1040 cal yr BP), the Medieval Warm Period (~970-570 cal yr BP) and the modern warm period, during which times the percent cold taxa reached a similar low of around 15%, suggesting comparable warmth. Notable cold events, in contrast, included the Chinese Period of Disunity (~1700-1270 cal yr BP), the Era of the Five Dynasties and Ten Kingdoms (~1040-970 cal yr BP) and the Little Ice Age (~570-270 cal yr BP), the latter of which periods had the highest percent of cold taxa in the chironomid reconstruction (~65%) and was thus likely to have been the coldest interval of the 4000-year record. In examining the relationship between climate (their chironomid temperature proxy and an independent pollen-based reconstruction from the same lake by Chen et al., 2015) and societal change, Wang et al. report that wars "occurred more frequently when temperature and precipitation decreased abruptly," although war events were more strongly correlated with temperature than precipitation. And in this regard, the most severe era of war events occurred during the coldest period of the record, i.e., the Little Ice Age. With respect to population, Wang et al. report that "an increase [in population] often occurred during warm periods," which provided relief to the harsh economic pressures brought about by poor crop harvests during colder periods, when yields were reduced by as much as 50%. Not surprisingly, reduced crop yields during cold eras would trigger higher food prices and famine, creating "large numbers of homeless refugees and outbreaks of plague," eventually resulting in "wars and social unrest which acted to reduce the population size." In light of the many findings presented above, it would appear that temperatures in this portion of the Shanxi Province of China are no warmer than during the Medieval Warm Period and not quite as warm as the Sui-Tang Warm Period, revealing there is nothing unusual, unnatural or unprecedented about modern temperatures and that rising atmospheric CO2 concentrations are having little, if any, impact on them. Wang et al. 's work also demonstrates that social unrest and war are far more likely to occur when temperatures are cooling as opposed to warming, which relationship is in direct contrast to that promoted by climate alarmists. Figure 1. Comparison of (a) cold-preferring taxa percentages and (b) reconstructed precipitation at Gonghai Lake (Chen et al., 2015) with (c) frequencies of wars in Shanxi Province, China, and (d) population size (in units of 1 million, square dots) of Shanxi Province during the past 2300 years; the data are spline connected. Grey shaded areas indicate cold events. Source: Wang et al. (2018). Chen, F.H., Xu, Q.H., Chen, J.H., Birks, H.J.B., Liu, J.B., Zhang, S.R., Jin, L.Y., An, C.B., Telford, R.J., Cao, X.Y., Wang, Z.L., Zhang, X.J., Selvaraj, K., Lü, H.Y., Li, Y.C., Zheng, Z., Wang, H.P., Zhou, A.F., Dong, G.H., Zhang, J.W., Huang, X.Z., Bloemendal, J. and Rao, Z.G. 2015 East Asian summer monsoon precipitation variability since the last deglaciation. Scientific Reports 5: 11186, https://doi.org/10.1038/srep11186.